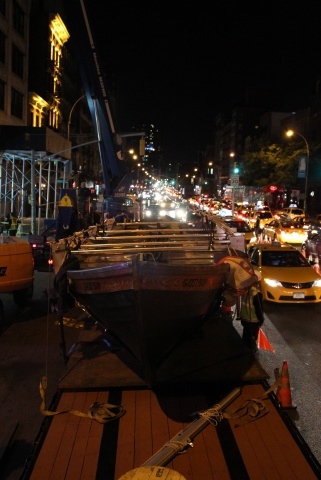 It has been a little over a month since the New Museum’s solo exhibition of Chris Burden, “Extreme Measures,” closed. 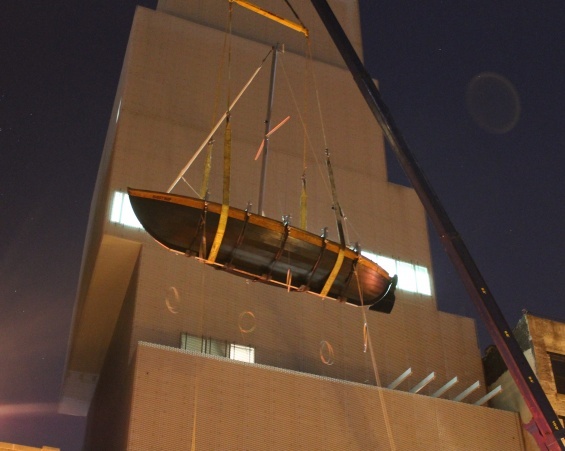 Two works central to the exhibition—Ghost Ship (2003) and Twin Quasi-Legal Skyscrapers(2013)—both installed on the building’s exterior, will remain installed for the foreseeable future, now corralling attention exclusively toward Burden’s interaction with institutional architecture. This long-term area of interest for Burden is a core thread that has driven other projects such as Samson (1985), an entry turnstile rigged to two large timber beams that push into the interior-bearing walls of the museum with each new visitor, and Wexner Castle (1990), the addition of crenels and merlons to the Peter Eisenman–designed Wexner Center for the Arts, effectively rendering it as a fortified compound. Such works show Burden engaging architecture’s physical forms and capacities as much as the institutional priorities and negotiations with power that architecture siphons. This shift of attention now squarely on Burden’s exterior installations provides a timely opportunity to discuss the artist’s particular response to the New Museum’s SANAA-designed building, as well as the Museum’s greater context in downtown New York. In spite of Burden’s rather amicable response to the Museum’s architecture, this interaction has nonetheless challenged the institution’s capacities, requiring intensive, interdisciplinary collaboration and negotiating multiple risks—something that has been at the heart of Burden’s practice since the early days of his career. Here, we discuss the physical and curatorial demands of installing Ghost Ship and Twin Quasi-Legal Skyscrapers with Joshua R. Edwards, Director of Exhibitions Management, Margot Norton, Assistant Curator, and Bevin Savage-Yamazaki, Associate at Gensler, the New Museum’s Architect of Record. 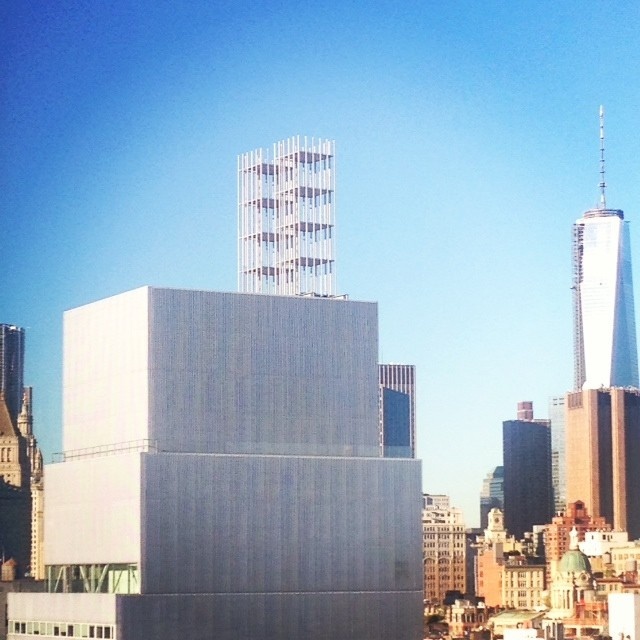 Let’s begin by discussing how Chris Burden’s Ghost Ship (2005) and Twin Quasi-Legal Skyscrapers (2013) relate to the architecture here at the New Museum? 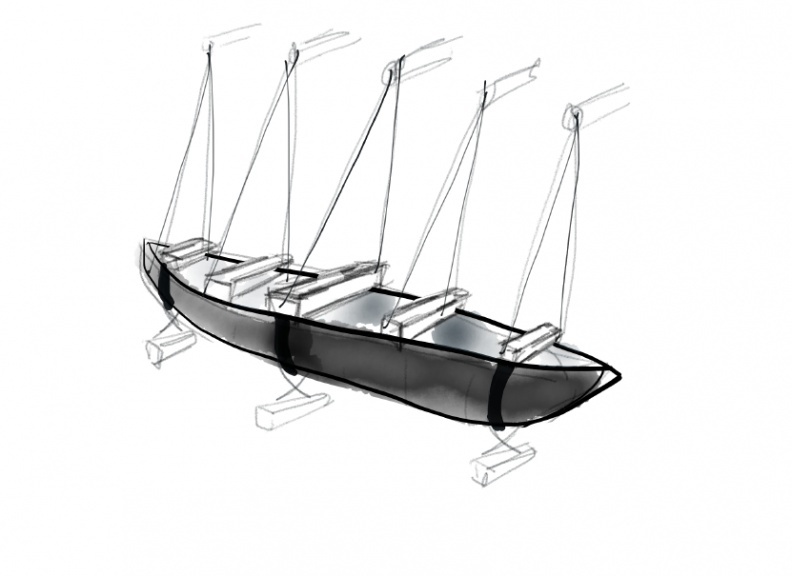 Margot Norton (MN): For Burden, Ghost Ship was intended to hang on the façade of our building much like a lifeboat hangs on the side of a ship. When Burden made Ghost Ship eight years ago, he sailed it unmanned, guiding it remotely by a computer, on a 400-mile journey from off the coast of Scotland down to Newcastle. 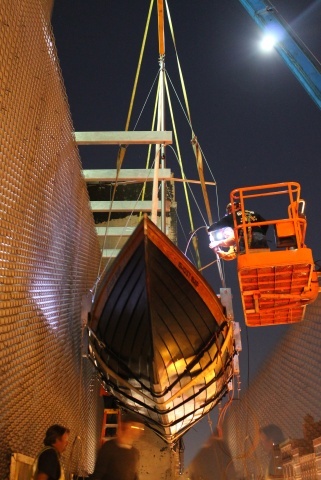 Installing the ship on the façade was a particularly complicated task because we not only had to make sure it was secure, but also had to factor in the possibility of natural disasters in light of the all-too-recent Hurricane Sandy. Twin Quasi-Legal Skyscrapers is a more subtle intervention that alters the silhouette of the building. 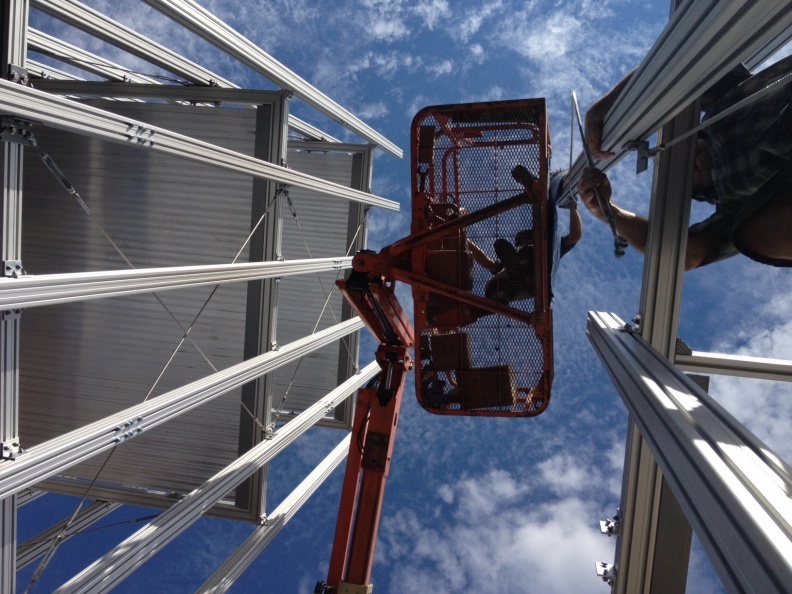 The structural aluminum framing of this work is similar to SANAA’s aluminum sheath over the building. 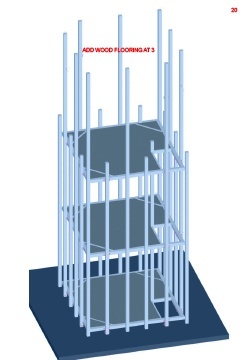 Ten years before he created Twin Quasi-Legal Skyscrapers, Burden made Small Skyscraper (Quasi Legal Skyscraper) (2003) in collaboration with TK Architecture. The idea was that the structure would fit within a loophole in the Los Angeles County Building Code because it was the maximum height and square footage that could be built without a permit. When seen on the roof of our building, these whimsical, thirty-six-foot-tall structures look very small in comparison to the New Museum. However, they alter the skyline slightly, commenting on the constantly changing nature of the urban landscape while also evoking the lost Twin Towers. Even though the work appears seamless with our architecture, the structures actually took a lot of complex planning to install on our roof. Bevin Savage Yamazaki (BSY): It’s interesting to consider how the works relate to the New Museum building—while I do believe there was a successful connection, I am not so sure an obvious or coherent relationship is ultimately required for Burden’s works to successfully inhabit the architecture. Sometimes the union of art and architecture can be one of disparate pairings, but it can be an interesting opportunity for an architect to see their building take on a new persona and temporarily exist in a new light. Last October, I moderated a panel at the New Museum that tackled the guts and glory of working collaboratively across creative disciplines. The most significant take away for me was the role selflessness plays in collaboration and that bringing a spirit of generosity to the relationship can yield unique and unexpected results. With this in mind, I feel the Museum has maintained its own presence in the realm of Burden’s pieces, but has also become a canvas for their being. This new role allows and encourages visitors to view the architecture in a new light and experience it in a new way. Sometimes it’s the dissonance between forces that creates the moment. Could you talk a little bit more about how you think of the relationship between art and architecture, generally? BSY: I feel the role of museum architecture is to provide an environment for art to flourish while creating a unique experience for the visitor. I am not a believer in the museum as mausoleum or monument to ego, where the role of art becomes secondary, wallpapering the interiors and decorating the background. That being said, the architect must play a role in creating an individual personality for the institution to set it apart from its peers, allowing its singularity to shine. So a balance needs to be achieved. It is within this nuanced space that the New Museum thrives. It was designed to be more than a white box, it can be adapted to create unique containers to house art, with different size boxes and ceiling heights specifically relating to a piece. The spaces create distinctive encounters with the art. It should also be noted that the New Museum’s uniqueness lies, in part, in its sheer fortitude to take great leaps of faith in the name of art. In 2012, we helped Joshua and the Museum carve through two of the gallery floors to install Carsten Höller’s Slide (2011), as part of his exhibition “Experience.” This work not only challenged the very structure of the architecture, but in its wake, the gallery floors will forever display the memory of the sculpture. Similarly, Burden’s “Extreme Measures” followed through on its title by pushing the Museum and consultant team to the very edge of what was structurally and logistically possible for the building and the city. By allowing the Museum to be inhabited by art, the building, its architecture, has become something new—a collaborator, part of the interdisciplinary conversation between art and architecture. MN: It’s interesting to look back at the original proposal and consider the ways Burden applied his practice of testing the limits of the institution, challenging our customary practices and attitudes as a contemporary art museum. When we invited Burden to do an exhibition at the New Museum, his initial proposal was to adorn the exterior of the building with sculptures and to leave the interior of the Museum empty. This proposal included Ghost Ship and Twin Quasi-Legal Skyscrapers, in addition to three skyscrapers composed of Erector parts and fifty-eight lampposts on every ledge of the building, some of them suspended upside-down. Recently, Burden has had multiple occasions for grand gestures and public art projects, such as his lamppost piece Urban Light (2008) at LACMA and his towering Erector set skyscraper, What My Dad Gave Me (2008), commissioned by Public Art Fund at the Rockefeller Center in New York. However, we felt that the type of presentation of Burden’s work that had been missing was a comprehensive survey. In fact, the last major exhibition of his work in the United States was at the Newport Harbor Art Museum more than twenty-five years ago. We began discussing two ideas: “Xanadu-Dream City” and “Extreme Measures.” “Xanadu-Dream City” would focus on works that engage the urban experience and would include a selection of pieces that reconfigure architectural structures and models to create an imagined cityscape on both the interior and exterior of the Museum. “Extreme Measures” is the idea for the exhibition that we went with in the end. This would include a complex and rich presentation of works that engage with the dynamics of power and focus on Burden’s ongoing examination of the breaking point of materials, institutions, and even himself. As the interior for “Extreme Measures” started taking shape, we decided, together with Burden, to simplify the exterior and focus exclusively on Ghost Ship and Twin Quasi-Legal Skyscrapers. How much of a bearing did logistical factors have in addition to the curatorial criteria? And at what stage were the conversations around Burden’s proposal extended beyond the curatorial team? Joshua R. Edwards (JRE): The Exhibitions Department and engineering and architectural consultants were brought in fairly early for these pieces. I think the first meeting Bevin and I were both in was back in January 2012. Simpson Gumpertz & Heger (SGH; our structural engineers) presented a feasibility study of what Burden had originally proposed, and every piece was up for discussion. 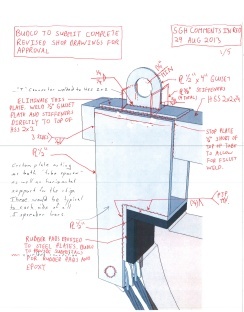 They came up with some clever solutions for how we could conceivably mount lampposts upside-down from the façade, and how we could remove certain skylights that the lampposts would have to penetrate in order to tie into the Museum’s architectural skeleton. It was an amazingly ambitious proposal by Burden, and it was an equally ambitious game plan we were considering. 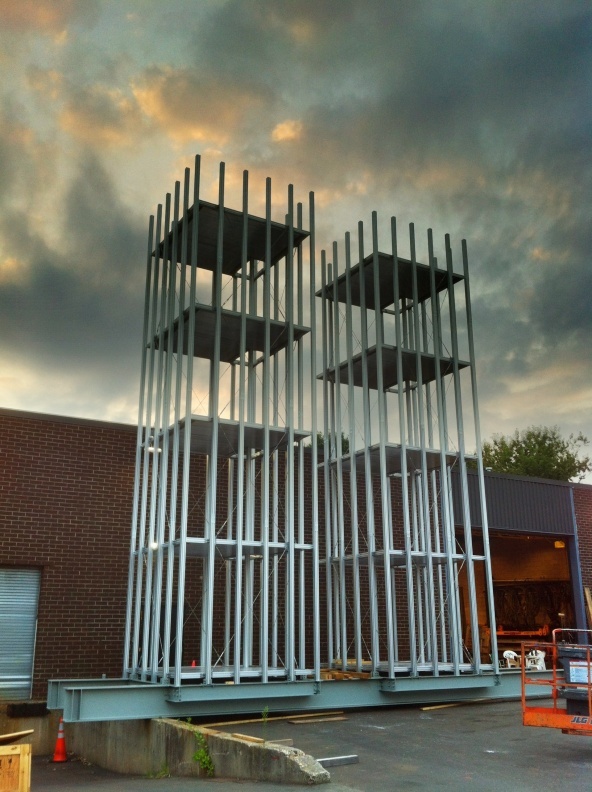 Ultimately, as Margot says, we took a more conservative approach with the exterior, which sounds comical knowing how much work went into actually installing those pieces. The initial concept designs presented by SGH really weren’t that far from what we ended up building. The concepts were there, but then the hard part began when we started proposing connection details, material types, specific positions in relation to the building, and constantly adjusting and refining those decisions. Making sure that not only the pieces are structurally secure, but also that the artistic intentions are being followed as closely as possible is a very involved process. For large-scale installations of this nature, the task of coalescing the artistic ambition with the laws of physics can really make or break a project. At what point were you certain that Ghost Ship and Twin Quasi-Legal Skyscrapers would actually be feasible? JRE: Is “the day they were installed” an acceptable answer? No, we knew everything would work in the end, but some of the particulars came down to the wire. For instance, some of the connection details for Ghost Ship weren’t finalized until the week before it was installed. This might seem surprising, but for projects as complicated as these, it’s more common than people think. The task of constantly adjusting and refining decisions takes a massive amount of time, patience, and as Bevin said, fortitude. Ultimately, you’re trying to satisfy an artist, but also architects, engineers, city planners, curators, and most importantly Mother Nature… and she’s rather uncompromising. This notion of collaboration, in which the role of selflessness and the spirit of generosity can yield unexpected results, can also involve a large element of risk: a risk in the deferral, the negotiation, or complete letting go of control in order to create a space for other participants. It’s a risk to open up a project or process to the other voices—and yet this is a risk that’s also mitigated by trust. BSY: Exactly. The key component to creating openings within the project for everyone’s vision is to cultivate trust. This really begins once all the collaborators buy into an idea, however loose. As the project progresses, this idea evolves to incorporate concepts and resolutions, all nurtured by the notion of a joint endeavor. JRE: Agreed. For these large-scale architectural projects that Bevin and I have been a part of, trust between the Museum, artist, architects, engineers, and contractors is paramount and it can actually be dangerous if it’s not present. Some of us have now worked on about four projects together over the years, and the relationship we’ve developed makes everything smoother. On the other hand, there are other types of projects where the whole notion of risk holds you back and you have to let chance dictate the aesthetic. For those projects, being a good collaborator is getting out of the way and letting the artist run with something. Projects like Paweł Althamer’s Draftsmen’s Congress, which recently opened on the Museum’s Fourth Floor as part of his exhibition “The Neighbors,” is a good example. With each day, visitors add their own drawings to the Museum’s walls, and with each day, the entire collaboration grows stronger. This alternating/balance/negotiation between risk and security/trust is ultimately also what allows for the double bind that has come to be recognized as integral to Burden’s practice: Once researched and committed to, the high-risk endeavors are “managed” quite intensely. Limits are pushed but within carefully monitored parameters. Can we turn then to a more straightforward, but no less interesting form of risk-taking that Burden has engaged in: the risk of creating work that is almost antithetical, at least in its form, to his performance works that have become part of the canon of art history. This might also be a curatorial risk too, or a risk in what it demands of its audience. How did you think through these very marked shifts in Burden’s practice? MN: I would argue that Burden’s primary concern has always been sculpture, and in fact, the way that he used his body in his early performances was as a form or material that shifts and changes as it is manipulated. I would also argue that the way that Burden’s early performances have been historicized has been problematic. For example, Shoot (1971), where Burden’s friend shot him in his left arm with a .22 rifle from fifteen feet away, prompted more than one critic to label him the Evel Knievel of art. Being a daredevil and causing a spectacle was actually quite contrary to Burden’s motivation with that work, which was conducted—as with his other early performances—more as a controlled experiment than an act of bravado, and only witnessed by a modest audience of twelve. Regardless of how critics may have sensationalized Burden’s work, for him, or for any artist for that matter, when notoriety surrounds a specific type of work, it is a risk to venture into something new. When Burden shifted his practice from performances that tested his own physical capacities, to sculptures (some more performative than others) that tested the capacities of materials, he was taking such a risk. Of course, it is also a curatorial risk and a risk for the institution to focus an exhibition on works that are not the artist’s most well-known. I am sure that many visitors who came to the exhibition expected to see more of the early performance work. However, for Burden, that body of work cannot be reproduced. It existed in a certain place and time, recorded only through carefully selected video and photographic documentation. At the New Museum, it was our fundamental aim to produce an exhibition that looked at the entire arc of Burden’s forty-year practice, as opposed to maintaining a focus on the first seven years when he was making performances. JRE: The connections between his earlier work to the most recent are quite interesting. Many of his performances pushed his and the viewer’s personal boundaries and limitations of what he and they were capable of enduring. With this newer work, I don’t necessarily think his intention was to simply transfer that challenge to the individuals working on the projects, but more testing the idea of limitations itself. We all develop a construct that we accumulate through time and experience of what can and can’t be done, what is or is not acceptable or tolerable. I see it as the responsibility of the artist to keep us all abreast of the limitations we’ve developed that may be blinding us to what is possible and make sure that we are always pivoting in order to look at the world anew. Personally, I think this is a unifying element that runs throughout Chris’s work from the ’70s up through these new installations we’ve had here at the Museum.